German Beer Steins were originally produced to combat health issues that triggered the Bubonic Plague. Strict laws enforcing sanitation on the ingredients, transport, and quality of beer led to a vast improvement in the taste of German beer. 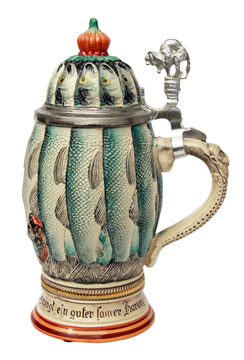 This in turn placed a higher value and importance on the Beer Stein and made owning your own unique stein a thing of desire. A Beer Stein became a status symbol and display piece for each German family emblazoned with a household crest, shield or expression. As the old saying goes: "The German will place great value on that which brings him his food or drink." Likewise we place great care and esteem in bringing you that which has fascinated collectors since the 13th century, The German Beer Stein. 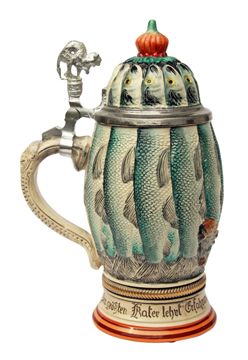 All of the German Beer Steins featured on our site are handmade, hand-painted, exceptional works of art. Each Beer Stein is carefully crafted by artisans in Germany of historic origins (Thewalt, King-Werks, Zöller and Born) and imported by sea. Every Limited Edition German Beer Stein is individually numbered and stamped with the manufacturer's mark and country of origin, making each Beer Stein strikingly distinctive. Beer steins are popular in Germany, America, Japan, Russia and practically in all other countries as a thoroughly German original product. What is the reason behind the fascination exercised by a product whose practical value has long been replaced by beer glasses? Is it its German origin? The world is not very particular about that any more! Is it its colorful appearance? That can be enjoyed in many other objects too! Is it its lid? Perhaps as a practical cover to keep off the flies? * Because it's imposing and manly. 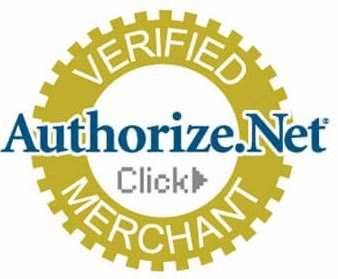 But so were the drinking horns out of which the ancient Teutons lapped up their mead - a hooch which was neither beer nor wine. *Because a beer stein is just right to bang on the table (or possibly on your opponent's head) without the unpleasant accompaniment of glass splinters. *Because beer and beer steins belong together as if by wedlock. *Because beer is a special beverage which has its own image and thus deserves its own receptacle. Can you imagine drinking beer from a wine glass or wine from a beer stein? The idea is absurd, although -how ghastly!- the plastic cup has now become acceptable for both drinks. Just a second, I think I have it! Yes, that's it: A beer stein has a soul! You cannot hear it or taste it or see it or feel it - but it's there. And, as the renowned pathologist Virchow said, souls cannot be dissected. Nor can they be explained by the cool, rational thinking of Homo sapiens. Above all, they are immortal - and that seems to be the core of the whole matter. Thus - in spite of croakers and prophets of evil - the beer stein will live on. Unfortunately nobody knows who invented it but, whoever it was, he deserves a monument! Monkey: The expression “monkey on your back” means to stop a bad habit, or be rid of a problem or hang-up. Because of this, the symbol of a monkey has come to represent over-indulgence in drinking. Herring: Long professed to cure a hangover, herring has become part of the German’s katerfrühstück, or "hangover breakfast." The breakfast usually includes marinated herring (rollmops). 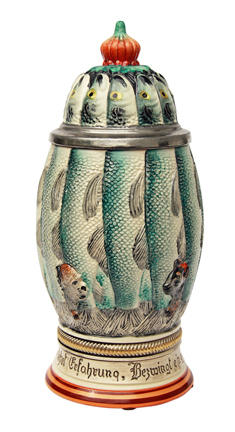 This unusual beer stein dipicts a cat, monkey and herring. Fox: A fox is symbolic for being sly, cunning and conniving. Lion: Symbolizing courage, valor, strength, bravery and royalty, the lion is often used to represent Bavaria, or its capital, Munich. Bear: A bear represents strength. It is also used as a symbol for Berlin, the capital of Germany and the country’s largest city. Pig: Germans view pigs, or schwein, as a symbol of good fortune and luck, which is reflected in expressions like schwein haben, which literally translates to “to have a pig,” but means “good luck.” This expression is believed to date back to the Middle Ages, when the loser in a competition was presented with a pig as a consolation prize.